It's February, which means it's birthday month! My birthday is exactly one week from today and honestly I can't even believe how old I'm going to be this year. This years age just feels a lot older than before. 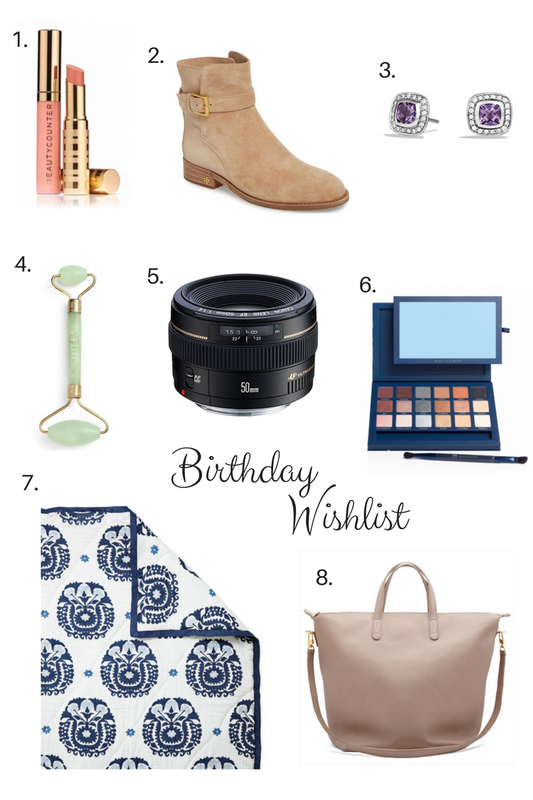 So in order to cheer myself up I put together a little birthday wishlist. Kyle and I don't really do big birthday gifts because at this point I pretty much just buy myself whatever I want, within reason of course ;) But if I was putting together a wishlist here is what I would have on it. Three. David Yurman Albion Earrings- these earrings are a huge splurge but have been on my wishlist for awhile now. I'm not a huge nice jewelry person, I prefer the cheap costume stuff I don't have to worry about it but I think these are classics that I would have forever. I have a few DY rings and bracelets and I just love how they go with my dressed up or down outfits. Four. Jade Roller- So I've been hearing so much about the jade roller and glowpro that I really want to give one a try. I'm hoping it would help de-puff my eyes on the mornings that my kids decide 5am is an appropriate wake up time. I'm considering trying a cheaper option from Amazon but everyone is saying just to go for the real thing. Five. Canon 50mm/1.4 lens- I'm still in the baby stages of learning to use my camera but everyone says having a prime lens is key to taking better photos so I have this one on my wishlist for once I learn how to really use my camera as an upgrade. Six. BeautyCounter Ultimate Nudes Eyeshadow Palette- This eyeshadow palette is another one I'm loving but since I just bought two eyeshadow palettes from BC in the last two months I've decided I need to hold off on this one for a little while so onto my wishlist it goes. The colors just looks so good! Eight. Cuyana Oversized Tote- It wouldn't be a wishlist without a handbag on it! I'm loving this oversized tote from Cuyana for spring and summer. The color is perfect and I love that it has two carrying options if you want it on your arm or on your shoulder. Loving the boots and the bag especially! Happy birthday month!!! Yay for birthday month! I am just starting to get into Beauty Counter too! I have been testing out their skin care stuff and I'm loving it! Also, love that tote!! Love love that quilt! Hope your birthday month is starting out great! Loving those booties, but all of these are great picks! Have a great birthday, and thanks for hosting! Great wish list and I fully support your treating yourself to everything on it!